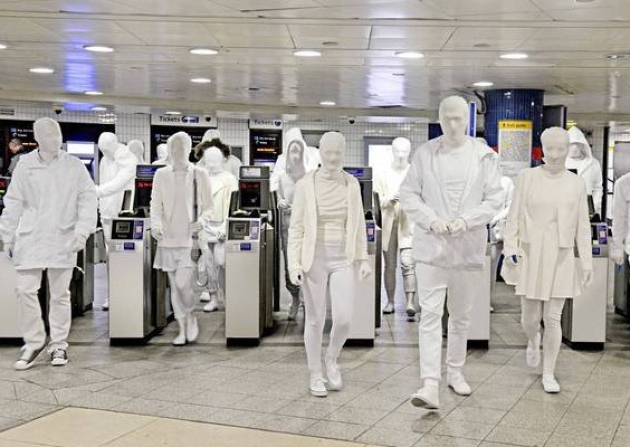 If you travelled by tube in London this week you may have seen an interesting stunt, organised by Dulux, the paint company. 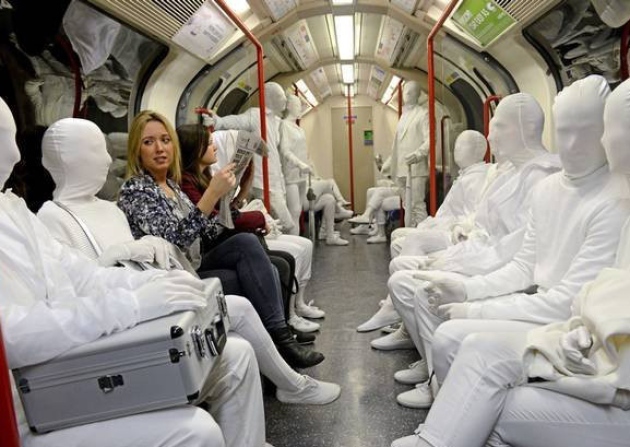 A dozen models dressed head to toe white jersey fabric “morph suits” got on at Oxford Circus and travelled on the Circle line. Dulux claim that Londoners have been rejecting louder sartorial choices in favour of grey and black over the past decade. I have certainly found that to be true. We seem to crave the anonomity that is associated with wearing black. In the gym in the morning, where I incidentally watch half a dozen women dress, I note that five out of six appear to be in black or other deep neutrals. Yet the message is rather a peculiar one. This is a paint company complaining that people wear a lot of black and grey. And what do you think the most popular colours are for paint these days? While Magnolia (a slightly pinky cream) held the top spot for years, now Dulux sells more “oatmeal” – a light grey, coolish, white. Same with the other companies. Grey is the most popular colour for walls too. Why do we stick to grey and black – the graphic shades – for our homes and everyday wear – rather than choosing colours that flatter and amplify our own colouring? Even though I make quite an effort to wear colour I have to admit I do really love grey myself. When do you wear colour, and why? All the time!! I have always loved colour, even as a teen my room was bright red and white. I particularly love bright colours and I really enjoy teaching people about colour and helping them to have the confidence to wear more options. Great idea by Dulux. Thank you for sharing, I hadn’t seen it. I really enjoy your posts. 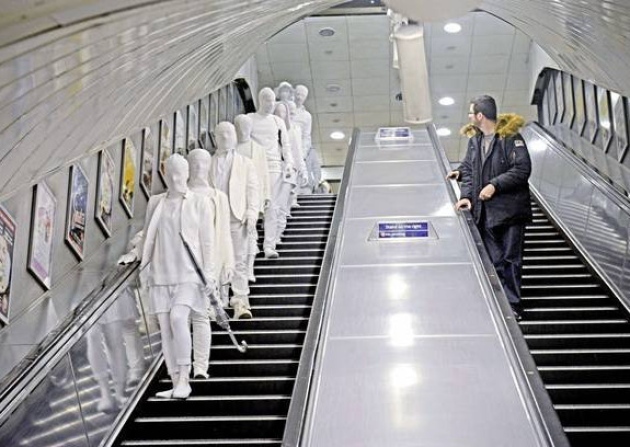 Seeing those white people would have freaked me out a bit! What I hear often asking women why they dressed in black colour is – it is easy. It takes some time to find colours that suits a person, good colour combinations. Another aspect is fashion. So often you are not able to buy cloths (fabric) in colours you want – as it is not in fashion. Wonderfully done. I’ve really enjoyed Letting the black go in my wardrobe on your suggestion Kate. The grey is much softer. My favorite conbo at the moment is grey and pink, especially as more and more grey hair has grown in. I do agree, there is so much black out there, everywhere. I think it’s mainly an urban phenomenon. People tend to blend in their environment like a chameleon. Go to the country and you’ll find more greens and browns. Go to a tropical place and not only the flowers will be colourful. Black is the easy way, plus not high maintenance. As for me, I own one black item of each kind of garment, and that’s enough ! But as Red Point Tailor mentioned it, it’s not easy to buy clothes in colours you want, and it is certainly why I like sewing so much ! A few years ago a sci fi movie was being filled in my Washington DC office building and I was distressed to see that all the extras in the crowd scenes were wearing shades of taupe, the worst color ever on me (because it IS all about me, right?). So anything but taupe for me, even black. Here in the US however I think the black everything is an urban or maybe even East Coast urban phenomenon, at least visitors from west coast cities have asked me why all the black when viewing crowds on the street, Metro, etc. And our delightful tourist visitors don’t seem to wear all black. One practical reason of course is that all these places are DIRTY and black shows that so much less. HOWEVER I’m sticking with my brights and pastels…..thank goodness for sewing and I follow your projects with great delight and awe. It’s funny…when I was in my 20s I wore a lot of black, which my step-father used to tease me about. It was for one reason only: on a limited budget I thought that black clothes were the most versatile, practical, easiest to maintain, etc. Now, I haven’t worn black in years, because it doesn’t suit me and it doesn’t make me feel happy. In recent years I have worn a lot of colour (lots of red and brighter blues and greens, especially in summer), though lately I’ve been craving more muted neutrals. I like white at home because it feels fresh and expansive. Coloured rooms often feel oppressive to me. On the other hand, I would love to see more colour on the streets. Grey and black also dominate here in winter clothing, making the streetscape quite bleak. Here on the West Coast, the predominant colours in crowds are neutrals but not so much black; lots of gray, beiges and army greens. As a teenager, and even into my twenties, I was always being scolded by my mother that I should wear more colour… and so I always had it in my mind that there was something ‘wrong’ with wearing black, my ‘colour’ of choice LOL. I forced colour upon myself whenever I could stomach it, but frankly, I just feel good in black, and I’m at the point in my life where I don’t particularly care what people think so black is a good portion of my wardrobe (although my mum still comments positively when I wear colours LOL). I don’t wear all black all the time anymore but I do still when I need to feel comforted, or when I’m having a stressful day. Thanks so much for your lovely comments, and I agree you look terrific in black Amanda! I imagine you would also really look great in the other deeper shades – navy (your Holly looked amazing), dark red, forest green, charcoal, deep blue-purple, dark blackish brown. Your own colouring is deep (dark hair, deep brown eyes) so all these shades will look stunning on you too, and would connect well with patterns in deeper shades if you wanted to bring that into the bottom half of your wardrobe. In terms of contrast with the black – white rather than yellowish creams, and I would go for the cooler, brighter shades that you like – bright blue, perhaps shocking pink and emerald green. And I laugh about your mother still having a view on what you should wear. Mine is the same – she is always trying to get me to wear my hair longer. Funny, I was chatting with some tourists from Melbourne yesterday when a fella walked past – dapper in an alt way – grey, black and a bowler hat. I commented that his look was so Melbourne. Melbournites are known to be slightly more edgy, I think black is credited with that artsy vibe. The lady replied “yes, people in Sydney sit on their taste”! I wasn’t entirely sure what that meant, but I took it to be a slight on our dress sense! The hotter the climate, the less black is worn I find.